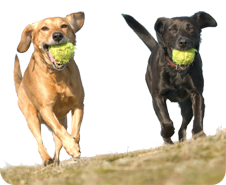 This is our most popular service; it creates a social environment so your pooch can enjoy interacting and making friends with other pooches. The usual number of pooches on a group walk is between four and five. This is so that we can maintain a high level of attention. Day Care is available Monday to Friday, your pooch will benefit from three walks with one of our experienced dog walkers, this service is most popular with puppies or any pooch looking for some extra attention. We alternate the walks to make it more exciting and adventurous for your dog.